Time to mark another PCS. 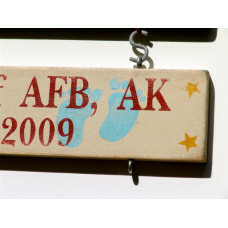 Customize this sign with all of your duty station milestones. An optional second line of text will give you the opportunity to add your command and/or the dates you were stationed in this location. You will find all of the options to customize it just over there to your right. 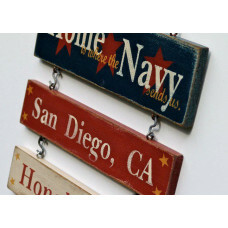 The signs are hand painted and distressed to perfection. Because of the uniqueness of the distressing process your sign may have a little more or a little less distressing than those in the pictures. 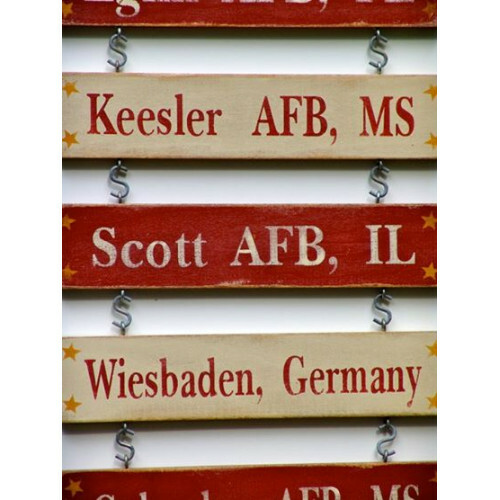 This listing includes one duty station board. The duty station measures 12"x2.5"x.5" and includes 2 "S" hooks for hanging as well as the 4 eye hooks. Description Hand-applied distressed antiqued finish. Painted Letters on wood. Mounting hardware included. Care Wipe clean with damp cloth. While each sign is coated with a Polycrylic finish, it is not advised that you hang in direct sunlight as fading will occur over time. I want a second line of text on this duty station.